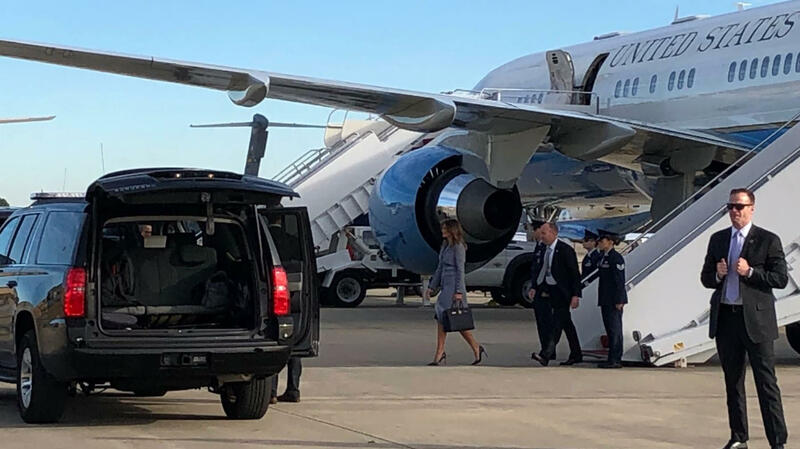 A plane carrying first lady Melania Trump unexpectedly turned around shortly after taking off from Joint Base Andrews in Maryland on Wednesday morning, according to a press pool report. The plane landed safely at the military base, and the first lady was seen getting off of the plane. Trump's spokeswoman, Stephanie Grisham, told reporters there was a "minor mechanical issue" and that "everything is fine and everyone is safe." Trump was heading to Philadelphia to meet with families of children who were affected by exposure to opioids while in the womb. In a statement late Wednesday, Air Force spokesperson Ann Stefanek said smoke coming from communication equipment in the front of the aircraft, a Boeing C-32A identified as "Bright Star," prompted the return to Andrews. Later in the morning, Trump departed from the base on a C-40 aircraft and resumed her schedule, visiting Thomas Jefferson University Hospital in Philadelphia. At the White House, President Trump told the Fox Business Network he spoke with the first lady after the incident. "She got in another plane. I said, 'I hope this plane's better than the first one,'" the president said. "But, yeah, they had a problem." The commotion started about 10 minutes after takeoff when some Secret Service officers were seen heading toward the front of the plane. Shortly after, a thin haze of smoke was visible and there was a smell of something burning in the cabin. The smoke cleared and the smell dissipated within minutes. The plane landed at Andrews at 9:05 a.m.